Separation distress is very tricky. Each dog shows different behaviors associated with their anxiety. Some are destructive, vocalize loudly or constantly, become hypervigilant of where their humans are at all times, while others do all of these signs and more. Many pet owners are unaware that the behaviors their dog is exhibiting are separation distress because there is such a wide range of behaviors associated with it. 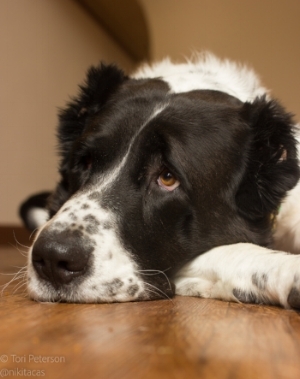 Owners may find some of the milder behaviors endearing, while others may even believe that their dog is being “spiteful” to them for leaving by destroying household items. These misconceptions frequently result in ineffective management of the issues. Some pet owners punish their dog for these behaviors which is likely to make the situation worse as the dog becomes more anxious. It is common for pet owners to take action after their dog is already at a level where they are being significantly destructive or disruptive because they were not aware of the milder signs. If you suspect that your dog is showing signs of separation distress, contact a knowledgeable trainer or behaviorist. As I mentioned in my blog about determining when it is the right time for medication, there is no quick fix for separation distress and anxiety. The behaviors listed above show that the dog is unable to cope from their anxiety which is challenging to treat in a lot of cases. The treatment process is long and requires a lot of patience and commitment to maintain success. A behavior modification plan is necessary to treat separation distress and medication may be needed as well. However, it is important to understand that medication is not going to magically fix the issue. Medication lowers the dog’s anxiety level to be able to maintain a mental state that is needed to effectively work on behavior modification. Medication is not a substitute for behavior modification. Managing behavior modification and medication is a delicate balance that does not take much to throw progress off course. My dog started medication at the beginning of October. After a couple months of modifying her dose and consistently working on her behavior modification protocol, I was able to leave for three hours to see clients. She was stable, I would come home and she would be relaxed on the couch. She was stable for about two months. Then, the veterinarian instructed me to reduce the dose of her medication slightly. This small change in the dose caused a setback in her progress, so we worked through it with her behavior modification. However, it was not enough and after adding an additional half an hour away from the house, she spiraled downward. She went back to destructive behavior and intense vocalizations. We increased her medication again, it will take a few weeks for her body to adjust, but the damage is done. This setback means that we need to start again, instead of being able to leave for three hours, now I’m not able to leave at all without someone being with her. I have to go back to the baby steps of desensitizing exit cues again. It is crucial to be able to recognize differences in behavior to catch a slip in progress as soon as possible. Any changes in medication and behavior modification management need to be thoroughly considered by a veterinarian that is knowledgeable about behavior medications. I recommend working with a veterinary behaviorist as they specialize in understanding behavioral issues in addition to traditional medicine, behavior modification and pharmacology and create a specific plan to meet your dog’s needs. If you don’t have a behaviorist in your area, find a veterinarian who is well versed in these medications with the addition of a trainer who can support you with the behavioral side of the issue. 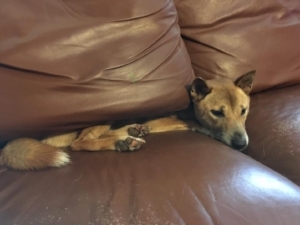 If any of your dog’s behaviors suggest that they may have trouble being alone, stop to the Facebook Community to discuss or send me an email at info@couchwolves.com! Primitive Dog Sleepovers? The Brennan Clan Plus Some of the Sumridge Crew! Getting Your Primitive Dog Started in Agility!